This product came quickly and was placed in the mailbox. The items were packaged well and were exactly as pictured. These toothbrush heads clean teeth and massage gums gently while effectively remove plague without irritating gums. Dentists recommend you replace the head every three months. These replacement heads have color bands so each family member can have their own...the bristles will also change color to let you know when it's time to change heads. These replacement toothbrush heads fit my Oral-B electric toothbrush. They were purchased at such a great price and there were so many that I can change the heads more often. Just what I needed, this set of toothbrush heads are great. The head replacement does a good job in brushing teeth and massaging gums. I ORDERED THE GENERIC REPLACEMENT TOOTHBRUSH HEADS FOR MY ORAL B ELECTRIC TOOTHBRUSH. THEY FIT IS GREAT ON MY ORAL B ELECTRIC TOOTHBRUSH. THE COST OF THESE REPLACEMENT TOOTHBRUSH HEADS ARE A THIRD OF WHAT I WOULD PAY FOR THE ORIGINAL TOOTHBRUSH HEADS. THANK YOU OVERSTOCK.COM FOR CARRYING THIS GREAT PRODUCT. These items are not Oral B replacement heads instead the items shipped to me were very poor knock off items. This was my first time ordering from overstock. I felt cheated and very disappointed. Great or price, great fit on the Oral B Vitality electric toothbrush. The bristles are just as soft, the brush head fits snugly into the colored ring, and fits snugly onto the electrical handle. The Vitality has a 2-minute timer, and no -- this brand of brush head replacement doesn't interfere with the timing mechanism whatsoever. This brush head also rotates/operates just like the Oral B replacements, or other generic substitutes I e purchased. I just ordered 2 more sets. Thank you. The product was named "Oral B Replacement Toothbrush Heads (16 Pack)" so I assumed that these were Oral-B branded heads. Unfortunately, these are off-brand knock off items. The description of the product is very misleading. I am very disappointed. Nice bristles - great for massaging the gums. My dentist office recommended an oral b electric toothbrush to help clean my teeth better than a manual toothbrush could. I got it and wanted to get replacement heads for it right away so I didn't run into needing some and not having any. I looked on and for a 3 pack of oral b sensitive brush heads it was $. Completely outrageous. I saw these on overstock and was skeptical that they would fit but they do perfectly! So happy with my purchase! Disappointed that these are not made by Oral B. The heads are smaller and don't snap on quite as firmly. They do work but it would be nice if Overstock mentioned that they are an aftermarket replacement. The pop-up window on the page shows real Oral B brush heads in original packaging. These are poor off brand replacements. These are not Oral B brush heads. They felt too hard so I tossed them. They fit the Oral B unit, but the brush heads are smaller than the brand product. I bought these for my Braun Oral B electric brush. The fit is great, and the price is far less than my local store. With 16, I'll have brushes for some time to come. 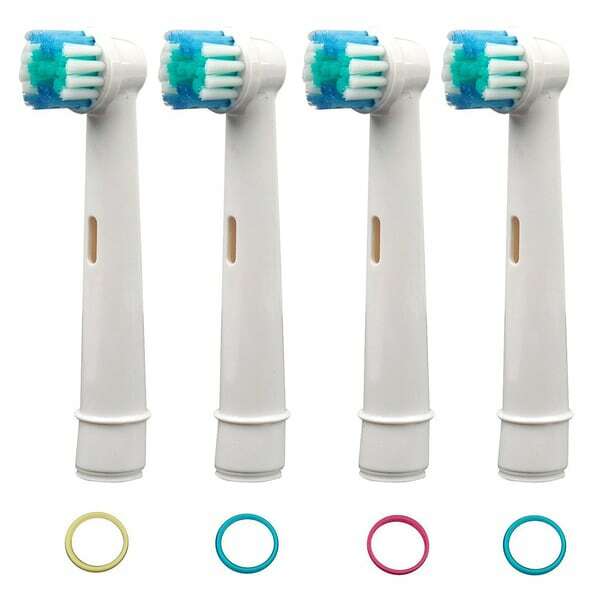 A fantastic bargain for these Oral B Compatible Replacement Toothbrush Heads. A pack of four (4) generic or two (2) Oral B Brand would have cost twice as much or more at the local market. I liked the price and the quality of the product. These are ok replacements for the price. It did not state that the bristles were soft. I will use them, but I will make sure before I order again that they are firm. They came very quickly, but I was disappointed in the bristles. They are not what it pictured. They are solid white. YES! This is a very convenient way to keep a good supply of brushes for your electric toothbrush. I got them in just a couple of days and they are not the cheap varity. They are also a great bargain at a pack of 16 for about eight bucks, sent right to my door. No more forgetting to buy them when I'm out. Thanks so Much! Deborah. These toothbrush heads are awesome. Totally just as good as Oral B. I would highly reccomend this product. I love my electric toothbrush and this collection of 16 heads is a special price. I had to buy 3 for the price of *** and use them spareingly,, but now I,m use one every month. It is wonderful and the world of cleanifulness. Go Oral B. "I am looking for replacement brushes which are not the Precision brand but themi Professional brand. It is stillmilk Brawn, Oral B electric but it says Professional on the side of the tooth brush and not Precision. The Precision type toothbrushes don't fit tight enough on the tooth brush base. Can you let me know where to find the Professional type Oral B toothbrushes? Thank you, Debbie "
"Are they soft, medium or hard bristles?" "Will these brush heads fit an Oral B Triumph? Also are they returnable? Are the brushes softer than Oral B brushes as someone said. " I don't know about the Oral B Triumph, but the bristles are on the soft side. Nice for massaging gums. They should fit. Brushes seem the same as Oral B. They fit my Oral B. They are good brushes and work quite well. I did notice that if you do not take off the head every time, it can be very hard to get off. My husband forgets to take his off daily. The head was so stuck I needed pliars to take it off and then the inner collar was still stuck. After hot water and the pliars again, I got all of it off. I didn't notice any difference in softness. "are these oral b brand or an generic off brand?" They're a generic or off-brand, but they work just as well. My husband likes them as they aren't real hard. These are generic. I sent mine back as it took almost a month before I received them. I also thought there were going to be brand name. they were generic but they worked just as well. hope this was helpful. "How do you replace with this brush? It doesn't work on my Oral B." This product should fit any of the Oral B electric hand held devices. I have one of the very first devices that came out and they fit perfectly. You simply pop it on the hand device. Not sure why yours wouldn't fit. Don't know why the brush doesn't work on your Oral B - work on mine. But the brushes aren't as good as the Oral B brand. Hi: Do you have a battery operated Oral B Toothbursh or an electric. I have a battery operated one. I don't have any problem with the replacements. Maybe they sent you the wrong item or there is a big difference between battery operated and ellecric. Hope I helped. "What model do these brushes fit? I am looking for the Oral B Vitality Sonic replacement brushes." Hello Coldwinter, these are compatible with the entire lineup of Oral-B rechargeable handles. Please let us know if you have any further questions. These are spin brushes, not for sonic models. This is a great buy. They cost $17.99 for 2 @ Walmart. A product we currently use and very pleased with. Great price.